Collision Care Auto Body Centers has served the Philadelphia, Pennsylvania area for over 80 years. The family-owned organization began as a single repair shop and has since grown to seven locations in the eastern Pennsylvania and western New Jersey region. Their success can be attributed to the organization’s focus on providing a superior customer experience by striving for excellence in every aspect of their business, from quality workmanship to hassle-free claims processing. As Collision Care built its 20,000 sq. 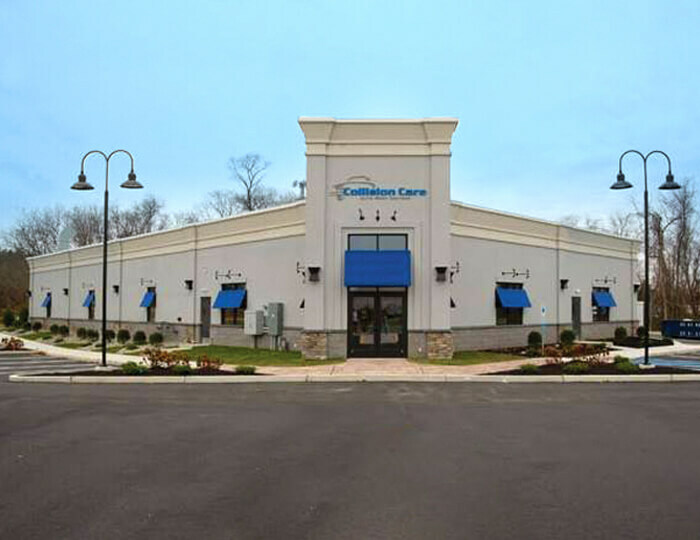 ft. facility in Mullica Hill, New Jersey, they sought to incorporate quality into the very fabric of their building. Of paramount concern was the 6,000 sq. ft. floor surface in the garage bays. An unprotected floor would leave the porous concrete open to stains, wear, and degradation. A poorly protected floor might reduce degradation of the concrete over time, but would quickly look unsightly—and would be contrary to the high-quality customer experience synonymous with the Collision Care brand. Collision Care turned to Delaware Valley Concrete Coatings, a trusted concrete coatings application company in the region. They knew that Delaware Valley Concrete Coatings uses the highest quality concrete coatings and were confident that Delaware Valley Concrete Coatings would provide a concrete coatings system that would be durable enough to withstand vehicle traffic, automotive fluid spills, and dropped tools and parts with minimal maintenance, all the while maintaining a like-new appearance for years to come. 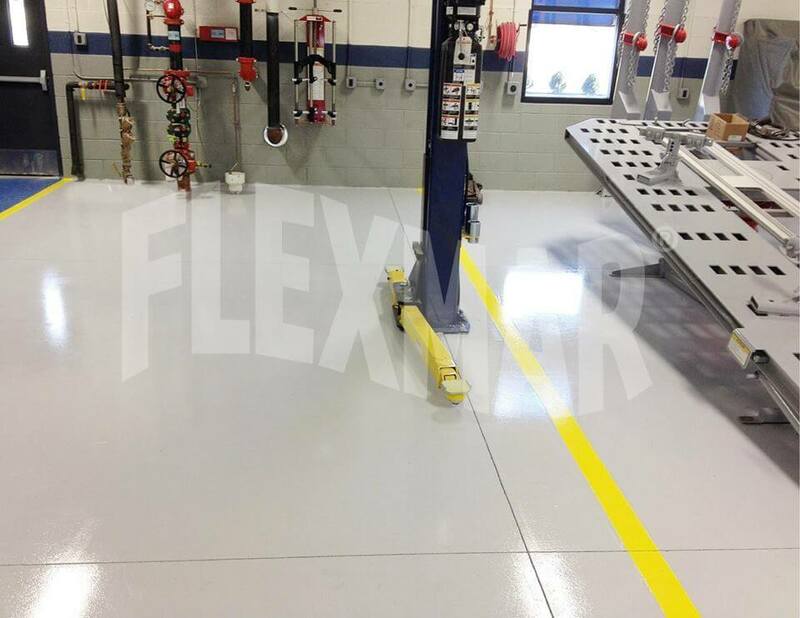 Delaware Valley Concrete Coatings uses FLEXMAR® polyaspartic coatings, which feature the durability, good looks, and minimal maintenance and cleaning that Collision Care sought as they completed construction on their new facility. First, the crew roller-applied an initial coat of FLEXMAR NextGen™ Self-Prime H.S. polyaspartic coating onto the concrete floors. They used a Sky Blue color for certain service bays and walking areas, and White Night Grey color for the remaining floor surface. After about an hour, they were able to continue with the next step. Next, the application crew applied a second coat of FLEXMAR NextGen Self-Prime H.S. polyaspartic coating over the base coat using the same colors. Again, after about an hour, the floor was ready for the final step. Last, the application crew applied a finish coat of FLEXMAR NextGen Clear Coat H.S. polyaspartic sealer with a slip reduction agent additive. This coat provides a higher final thickness and more gloss to the floor and “pops” the colors. After about an hour, the floor was dry, and personnel could walk on the floor and prepare to open the facility. 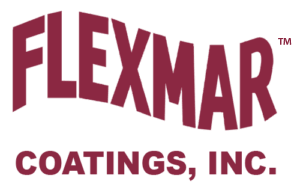 Floors protected by FLEXMAR polyaspartic coatings are up to four times more durable than those coated with epoxies, polyurethanes, and other coatings. When properly applied to concrete, they form a virtually impenetrable surface. They resist wear, abrasion and chips from foot and cart traffic, falling tools and parts, and other normal activities to which this floor would be subjected. They won’t bubble, blister, or discolor from hot tires. And they resist staining and degradation from a broad array of chemicals and mild acids—including most of the automotive fluids that would be spilled or leaked on this floor. 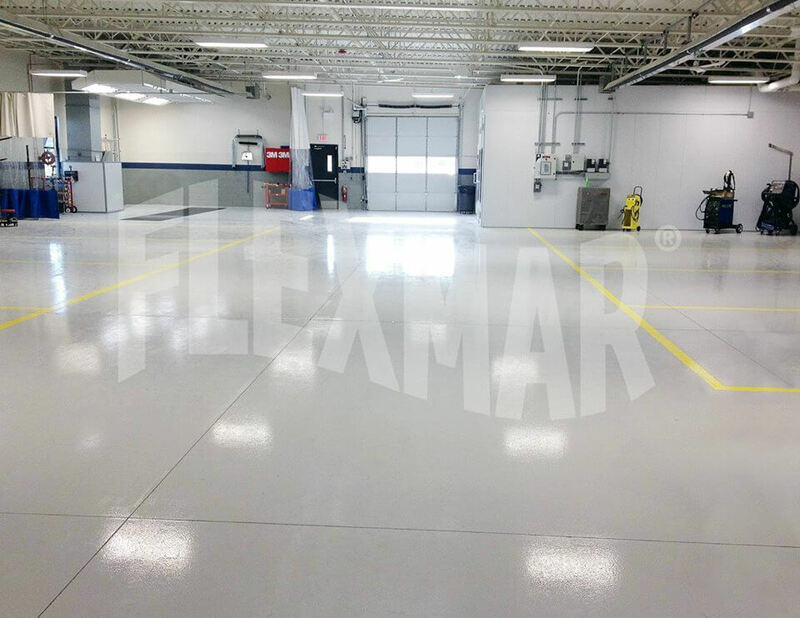 And for all of the rugged durability that the FLEXMAR floor provides for Collision Care, it minimizes cleaning and virtually eliminates any routine maintenance. There’s no need to strip, wax, polish, buff, burnish, or clean with harsh chemicals. FLEXMAR floors are seamless, so there’s no grout to repair. Dirt and bacteria have no place to hide. All that’s required is to periodically sweep the floor, or use a wet mop with a mild detergent. Of course, the combination of superior durability and minimal cleaning and maintenance makes for a floor that will look great, day in and day out, for years. The high-gloss finish of the coatings helps to “pop” the colors and reflect light, making for a brighter, more inviting—even safer—area. Plus FLEXMAR polyaspartic coatings and sealers won’t fade or discolor when exposed to sunlight and UV lighting. It’s the perfect coating system to highlight Collision Care Auto Body Centers’ commitment to quality.